After a ten year push by NE Middleton residents and several city staff, the alders and mayor finally voted “yes” on Wednesday night to secure funds from one tax improvement district to another to start the planning process of creating the NE Connector Trail along Century Avenue. Plans will be drawn in 2018, and the path will hopefully be constructed in 2019. This is a major breakthrough to connect what is currently a “car island” to the rest of Middleton and Madison as well as supply a safe route for children to bike or walk to school. These plans are the first segment connecting Branch St. to Highland. The city hopes to extend it to County Road Q to the east and Donna Drive/Frank Lloyd Wright Avenue to the West. Good work everyone who wrote in and supported the efforts otherwise! The news from Fitchburg are less good. A budget amendment to build paved shoulders on Whalen Road did not pass, despite support from Bike Fitchburg, Madison Bikes, and many others. According to news reports, the whole hearing was rather heated because budget issues concerning social services. On Wednesday, the first public involvement meeting about extending the Glacial Drumlin Trail from Cottage Grove to Interstate-90 happened. We don't have information about how the meeting went, but you can find the presentation slides here. Saturday saw the rebirth of Cranksgiving in Madison. 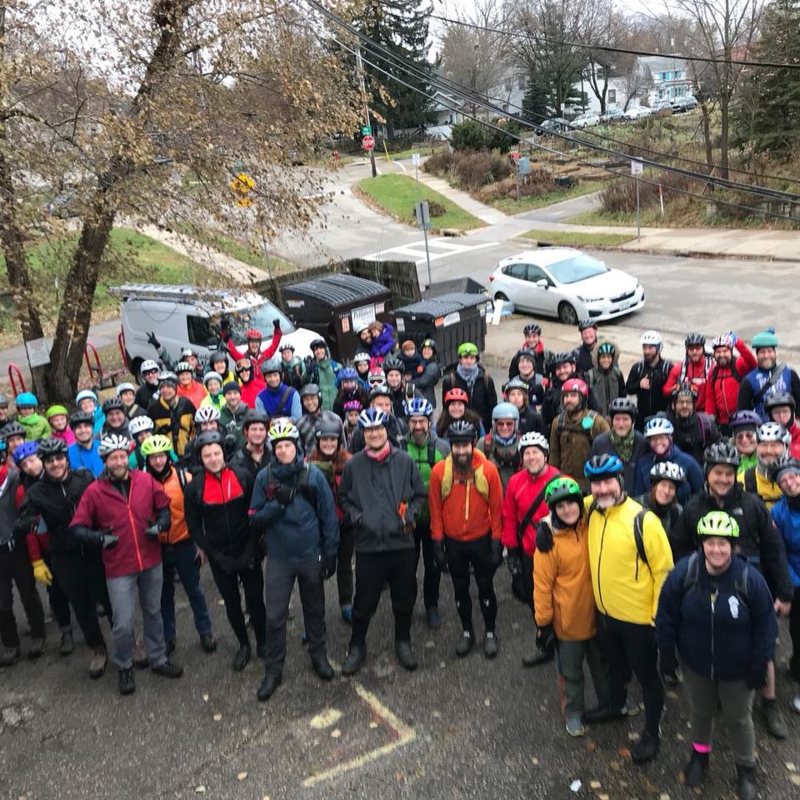 Cranksgiving, an event originally started in the 1990s by bike messengers in New York City, is a combination of a food drive and an alley cat bike race. Participants received a "manifesto" with a number of Madison supermarkets and items to buy there. At the end of the ride, all the food was donated to the Goodman Center's Thanksgiving Baskets food drive. Over 70 people participated! Kudos to Billy Calkins for organizing! With Thanksgiving coming up, the week is fairly quiet. Madison Bikes, however, has several things in the pipeline. On Monday, the Madison Bikes events committee will do the final planning for the Winter Bike Fashion Show on December 9. The deadline to apply as a model was on Sunday, but if you have a strong interest in being a model, shoot a quick email to winterbike@madisonbikes.org before Monday, 3pm! Also a reminder that you can still apply to become a member of the Board of Directors for Madison Bikes. And if you're not quite ready yet to join our board, remember that you can show your support for Madison Bikes by becoming a member. Local mountain bike advocates Capital Offroad Pathfinders are looking for a secretary for their organization. More details here. And on Friday, you can join the Bombay Cycling Club for their first fat bike ride of the season. Happy Thanksgiving from me and the rest of Madison Bikes!